I created this animated GIF from video I captured in my car, on my way to work. The animated GIF above that I designed appeared in the second December 2012 eNewsletter. You can’t tell – but that’s Steve Lombardi, RE/MAX of Texas Aviation Director, piloting the RE/MAX balloon, as he treated one of our photo contest winners to a ride. I even added a little holiday message at the end of the GIF, which in the newsletter, linked to a story about our holiday hours. The animated GIFs – which only work in some email clients, usually mobile clients (Sorry, Outlook desktop users) – are an added feature to the newsletter that I am charged with producing. Sometimes you miss the shot. But if you take enough photos, you can piece together the perfect image using Adobe Photoshop. If you’ve got a few hours to burn. 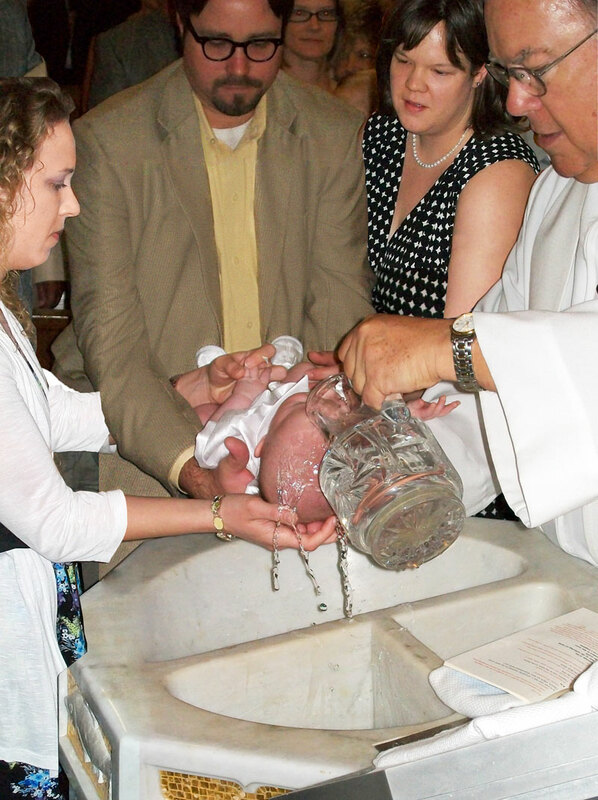 This is a compilation image I created by using Adobe Photoshop to combine four images of the moments when Marshall was being baptized on July 8. 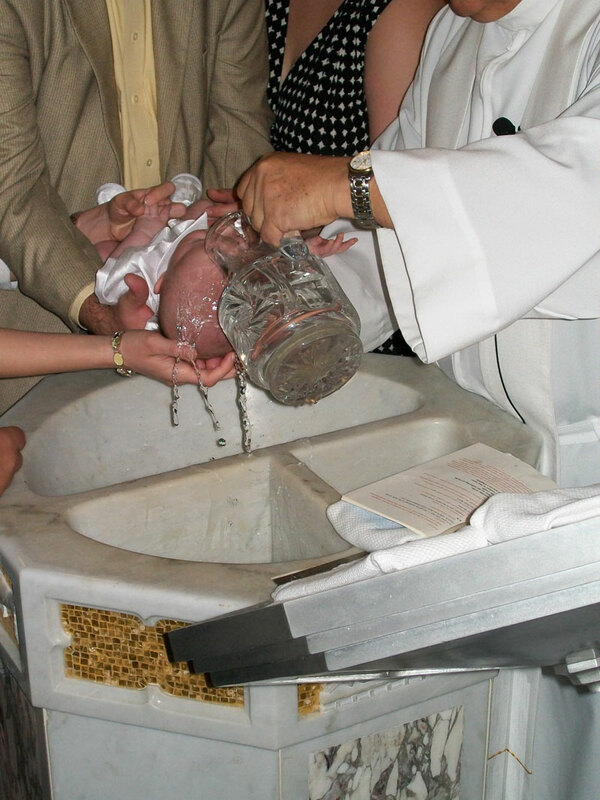 The photos were taken by my mother. 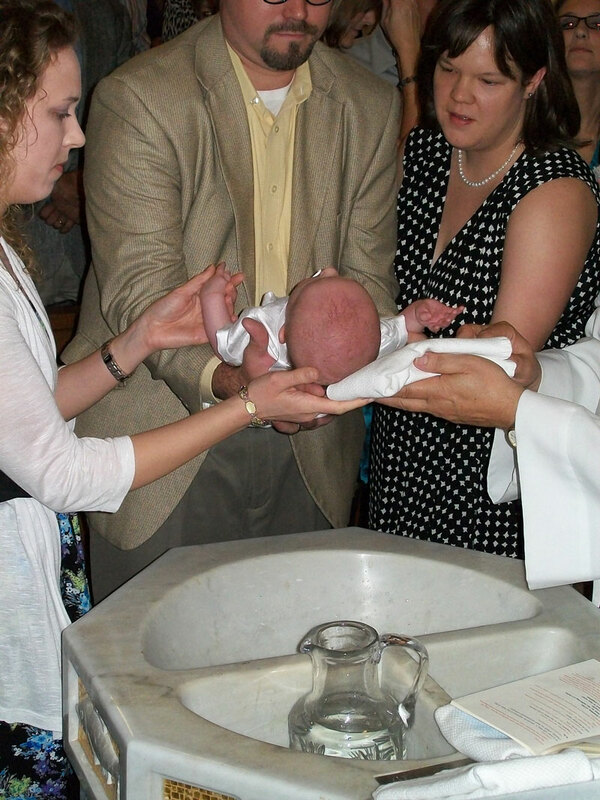 The combined image of Marshall’s baptism. When I redesigned the RE/MAX of Texas newsletter in March 2012, I wanted to keep pushing the medium by incorporating an animated GIF in every issue. Some of which, I’m more proud of than others. Here’s one I’m proud of: an animated GIF taken in Regional Headquarters upstairs in the green room, as the subjects stood in the RE/MAX balloon basket. 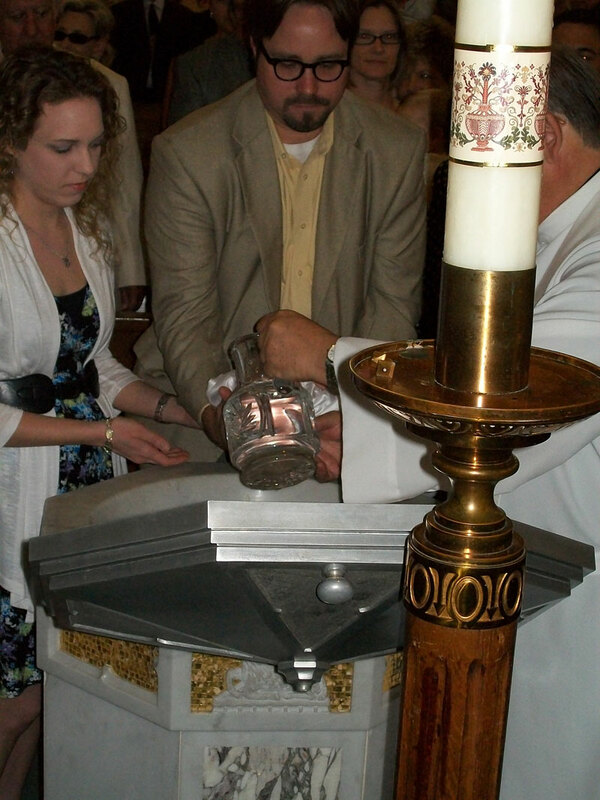 I took it from there to create this, as featured in the first September 2012 eNewsletter. I created an animated GIF for the RE/MAX of Texas eNewsletter that I compile every two weeks that features REALTOR Julie Morales and a quote she gave the story’s author about her decision to join RE/MAX. Though simple, the GIF presents the story in a sophisticated way that encourages readers to click. Today, I published an animated design that I created using Adobe Flash to my Hire Me page. I believe the animation answers that question well. 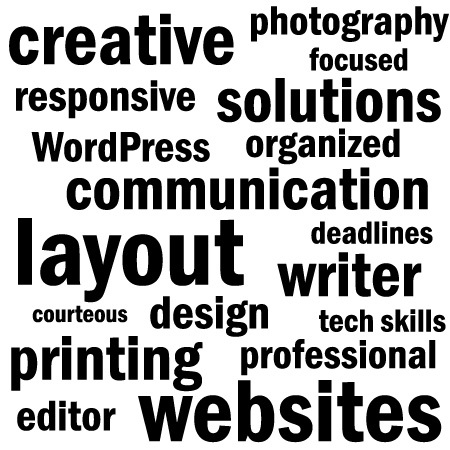 I imported many of the words into Adobe Flash from Adobe Illustrator. I coded the page to look for iOS devices, which are directed to the flash-free page I created using an QuickTime movie version of the animation that I exported from Flash. 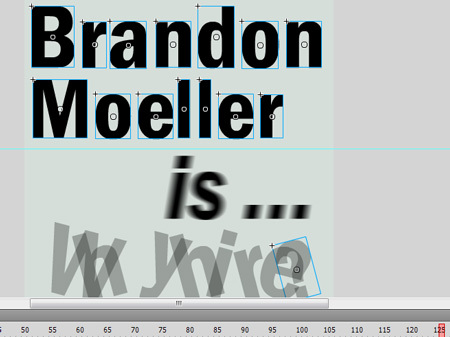 Posted on June 4, 2011 Categories BrandonMoeller.com, DesignTags Adobe Flash, Adobe IllustratorLeave a comment on Why hire Brandon Moeller? 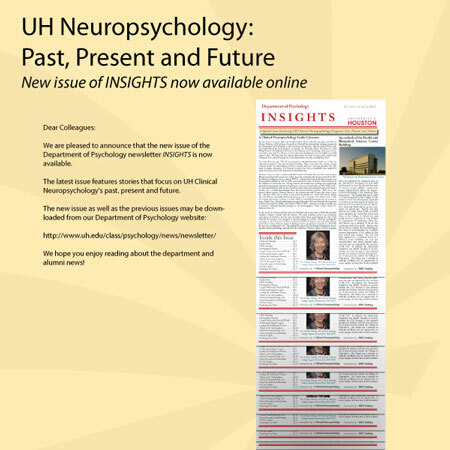 The Department of Psychology distributes a printed newsletter every semester called INSIGHTS. The newsletter is created and designed by the department’s Director of Development Lolin Wang-Bennett, who provides our CLASS Web Services office with a PDF version for posting on their website. As part of the promotion campaign for this issue, we scheduled a time with the University’s marketing department to launch an e-mail blast to inform selected members of the university’s alumni and donor database that the new issue is available online. UH uses the non-profit focused Convio to send e-mail messages to its constituents. 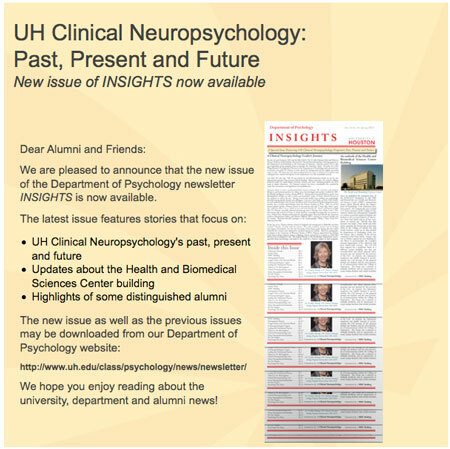 This is, of course, cheaper than just mailing it to everyone – though the Department of Psychology does mail it to select alumni. For this assignment, I worked closely with Lolin – who also shares a passion for backyard gardening – to design an e-mail that will quickly alert alumni and donors that the new issue is available. We decided we wanted the message to be short and sweet – she submitted the text for the message, my part of the assignment was to design it. This is a screen capture of the main part of the e-mail sent to promote the new issue of the Psychology newsletter. I had some fun with this one. For starters, I chose an attention-getting off-yellow and I created a pin-wheel-like design that would indicate something exciting is happening at the Department of Psychology. 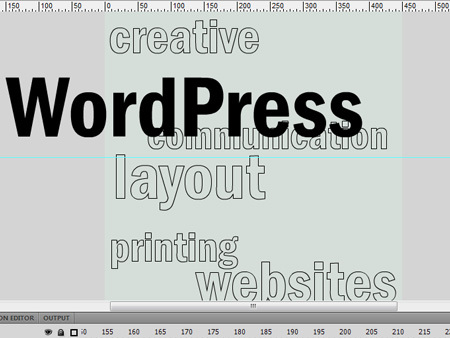 I designed the initial concept in Adobe Illustrator before building the tables in Adobe Dreamweaver. Yes, I designed the layout of the e-mail in tables – it’s the only reliable way a complex layout with columns will display properly across all browsers and clients when e-mailed. Designing e-mail: It’s like being stuck in 1996. This is the initial design of the psychology e-mail that I created, using Adobe Illustrator. For the secondary graphic, I took a screen capture of the PDF newsletter, and copied it to mimic the look of it running off the presses. I then used a gradient to shade it. I thought this presented the content in an interesting, yet not overwhelming way. Today, the e-mail message launched through the university’s Convio e-mail system. 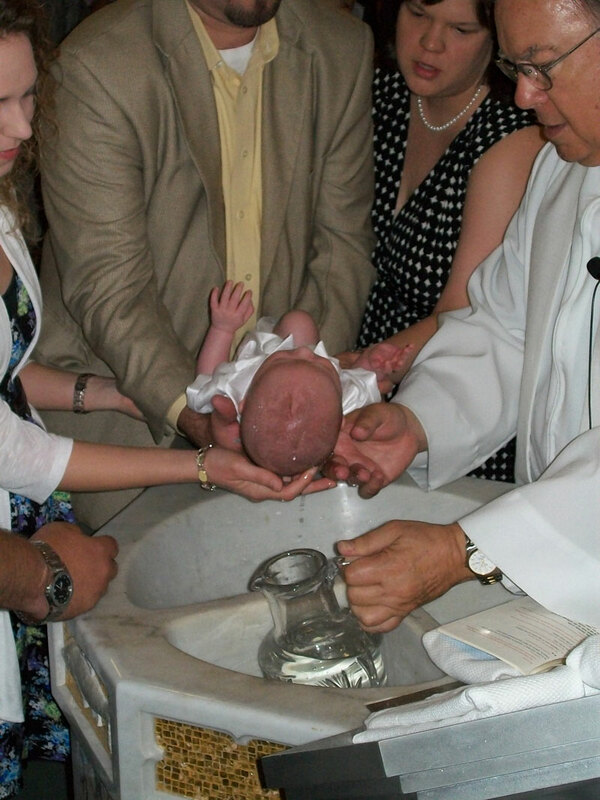 I have archived it here on my website. An interesting thing we discovered after running the message’s statistics in Convio: More than 2/3 of the audience that clicked through the message to see the Psychology Newsletters page did so by clicking the link in the text. The rest did so by clicking the image in the e-mail, which was also hyper-linked to the same page. 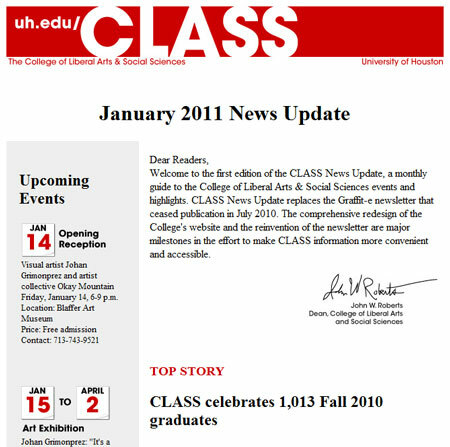 This is the e-mail newsletter I designed for the first issue of the new CLASS News Update newsletter for the College of Liberal Arts and Social Sciences at UH. A screen capture of the 'above-the-fold' newsletter content. I'm particularly proud of the unique nameplate and calendar graphics I created for this new form of communication for the college. The college’s Director of Communication decided which articles we would run under which category, and I designed graphics for the calendar items and ensured that all of the other articles had art to represent them. I was responsible for all aspects of the design of the newsletter. 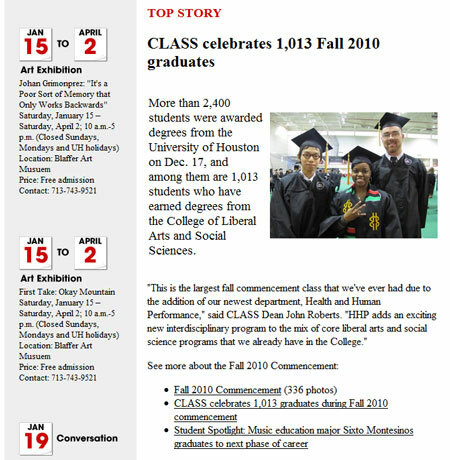 One of my photos that I took during the Fall 2010 commencement ceremony was published in this newsletter. The 'Top Story' section of the newsletter, featuring a photo I took and a brief synopsis of the main story we wanted readers to know about, with bullet-ed links for more information. The e-mail was sent through the University’s Convio e-mail system to more than 25,000 identified donors, alumni and friends of the college.